In celebration of Distilling Thoughts' 5th birthday, I decided to buy a domain. Basically only the URL was changed, making it more personal but the contents are the same. It's still the same distillery of thoughts thought there's a part of me wanting to improve it further. How I wish I know more about web-design and that time will allow me to write more. I have other ideas for my blog's birthday. I was planning to give away 5 Distilling Thoughts shirts (see above photo, the black shirts) but I was a bit disappointed with the way the shirts were printed. I have a different idea in mind but that wasn't translated into the actual product. There's no one to blame here really. I looked for the cheapest printing shop, of course, why would I expect too much. I still wear it though and better luck next time. Hopefully on its 6th birthday. Aside from the shirt thing, I wanted to do a self-portrait for my blogsary. This idea has been playing on my mind since January but I realized it was too difficult to achieve it on my own. Then I dialed 911 and asked for help. It was my good friend Kid Perez who picked-up the phone. Of course he agreed to do it and should he have said no, I'll still go to his place. Thanks man! Well, 5 years of blogging is a feat I guess. Since this is more of a personal blog, I am assured that I can have at least one entry per month. A significant entry or not. A travel. A musing. A rant. As long as my 1-blog-per-month quota is satisfied, I am more than happy. I always have at least one since March 2007. The total number of blogs per year dramatically decreases though. What's next for totomai.net aka distilling thoughts? Nothing much I guess. It will be the same but I plan to make it more interesting. Depending on how one define interestingness. I am not talking about flickr when I used that term. Lastly, Allow me to say THANK YOU for being a part of my blogging world. I will still continue to blog. to shoot. to distill thoughts. I won't get bored sharing a part of my world to you even you are already bored with it. It is always a pleasure to visit a blog site that does things a little differently. Thank you for visiting mine where adventures are a bit more conventional! Great change, love to visit your blog. Thanks for sharing your thoughts and your nice senryu. Great transition. And good luck with the new site. more power to you and you blog totomai! as always.. looking forward to your future posts! thanks kiddo! more posts and photos for both of us. Congratulations on five years! I'll be looking for those T-shirts next year! Your blog is looking good! I too purchased .com, . net and .org domains for mine a couple of years ago and it's made a big difference for very little outlay. haha adik. bakit ka nag mamask? obaachan mode? LOL! congratulations... 5 years! perhaps you could have another transition on the next 5 years. Never bored with it! Congratulations on five years! haha salamat more more party! i think i posted lots of stuff about japan already haha. anyway, i will try to write more about it and yeah, take to visit japan. some of my friends are visiting next week here. Hey, happy blog birthday. Where did the time go? congratulations John, and I owe it to you for you are one of the few who has inspired me to blog. And I so love your shirt, especially the white one! when can I have mine? Can you add a store here in your site, where you sell your shirts and other other products of distilling thoughts? Like, you have your poem, pics, then, we can mix and match to make our own shirt, I dunno, just a concept, but really would love to buy your shirt. I may make "The Joys of Simple Life" shirt too, gaya-gaya, hahaha!!! 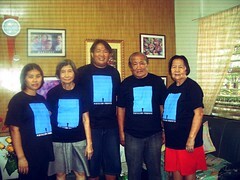 the joys of simple life would be a good shirt too :-) or joint business na lang tayo. happy fifth dear bruh! always an inspiration to read and admire your photos!!! keep it up, will always follow your posts! ;) sana makuha ko na t-shirt ko! haha..
haha nasa kina caloy na yung shirt mo. Great haiku! And congrats on the 5th annyversary! Good luck with the new domain. salamat Nay! haha walang handsome sa description? LOLOLOLOLOL! Congratulations! Blogging allows so many levels of creativity and it's wonderful that you celebrate it that way. Okay I'll try that Archna! I'll keep my readers interested on what I write. It's always a pleasure here. Carry on! of course I know it :-) Dont worry lol. w00t w00t! ikaw na! Happy 5 years pare! tuks, da best comment mo. parang magsasara na tuloy ang blog ko haha. musta na?